Time for another pub, and the Queens Arms, in Kensington, is the the closest pub to the Royal Albert Hall, and was built around 1910. It's a popular spot for students from the surrounding universities and also anyone popping in for a swift half before they go to see something at the Hall itself. 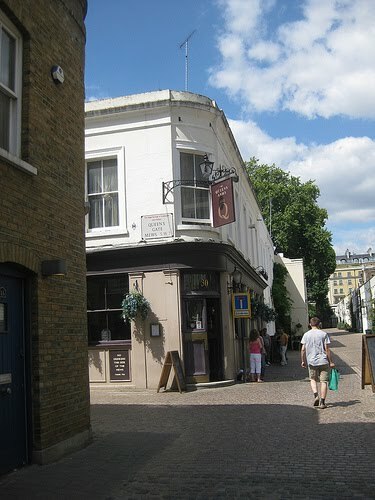 It's tucked away in Queens Gate Mews, so can be difficult to find, and its a nice enough spot, though when your author popped in recently for lunch the food he ordered didn't contain many of the things listed on the menu, and £11.80 for a burger and a pint seemed rather steep for what was offered. It is a nice place, especially for the food. Technically it is the closest pub, but for £1 membership you can pop over to Imperial Union right next to the RAH and pay student prices for drinks. Generally they also have a BBQ going.